Erickson Air-Crane Incorporated (Portland, Oregon) which operates the Erickson S-64 Aircrane, announced that its wholly owned subsidiary, Evergreen Helicopters, Inc. (EHI) (McMinnville, Oregon), has acquired five aircraft for $10.1 million that it has historically leased from a third-party. The acquired aircraft include two Bell 214STs, two Beechcraft 1900Ds and one CASA 212-CC. The Company’s total fleet size remains unchanged at 85 aircraft, now comprised of 35 leased and 50 owned aircraft. Erickson Air-Crane closed its acquisition of Evergreen Helicopters, Inc.(EHI) from Evergreen International Aviation, Inc. on May 2, 2013. EHI currently operates a fleet of 65 aircraft of varying rotary-wing and fixed-wing types for a wide range of passenger transport and light, medium and heavy load-carrying missions. This diverse fleet serves both government and commercial customers, including significant and critical programs with the US Military in support of overseas operations. EHI maintains a global presence with operations in North America, the Middle East, Africa, and Asia-Pacific. Total consideration for the acquisition was: $185.0 million of cash, $17.5 million in unsecured promissory notes issued by Erickson, and approximately four million newly-issued preferred shares, mandatorily convertible, at the option of the Company, into an equal number of common shares, subject to shareholder approval under NASDAQ marketplace rules, which the Company now intends to seek. As part of the acquisition, Erickson funded the acquisition by EHI of nine aircraft from an affiliate of EIA for approximately $13 million. As part of its integration plans, the Company will consolidate operations and will incur restructuring and other costs as a result. This entry was posted in Erickson Air-Crane, Evergreen Helicopters and tagged erickson air crane, Evergreen Helicopters on May 18, 2013 by Bruce Drum. Erickson Air-Crane acquires Evergreen Helicopters, Inc.
Erickson Air-Crane Incorporated (Portland, Oregon), a leading operator and the manufacturer of the powerful Erickson S-64 Aircrane heavy-lift helicopter, has announced that it has executed a stock purchase agreement for the purchase of Evergreen Helicopters, Inc. (EHI) (McMinnville, Oregon) from Evergreen International Aviation, Inc.
EHI is a diversified global provider of air transport services for cargo and personnel to government and commercial customers. EHI was founded by aviation pioneer Mr. Delford Smith. At closing, this transaction would provide Erickson Air-Crane with an incremental fleet of 64 aircraft, consisting of both helicopters and fixed-wing airplanes. This diverse fleet serves a wide range of customers, including significant passenger transport and airlift services for the US military. EHI’s operations span the globe, including a presence in North America, the Middle East, Africa, and Asia Pacific. In calendar year 2012 EHI’s unaudited revenue was $196.0 million and Adjusted EBITDA was $56.2 million, representing an Adjusted EBITDA margin of over 25%. The Company noted that when calculating EBITDA, EHI, in line with certain other aviation companies, adds back the amortization of certain capitalized overhaul costs. We are conforming our Adjusted EBITDA presentation, and adding back amortization of certain capitalized overhaul costs. For purposes of comparability, our 2012 Adjusted EBITDA, which was reported as $44.5 million, is $57.2 million under the new presentation. There is no change to the Company’s reported 2012 income statement or net cash flows due to this change in non-GAAP presentation. For a reconciliation of this non-GAAP financial measure, see “Reconciliation of Non-GAAP Financial Measures” in this press release. Under the terms of the purchase agreement, EHI is being acquired from EIA for $250.0 million, consisting of $185.0 million in cash, $17.5 million in unsecured promissory notes issued by Erickson Air-Crane, and approximately four million mandatorily convertible preferred shares of Erickson Air-Crane valued at $47.5 million (based on an agreed value of $11.85 per share). The preferred shares are convertible, at the option of the Company, into an equal number of common shares, subject to shareholder approval under NASDAQ marketplace rules, which the Company intends to seek following the closing of the EHI acquisition. In addition, up to $26.3 million in contingent consideration may be payable by Erickson Air-Crane (in cash or promissory notes) to EIA based on certain revenue targets for the calendar years 2013, 2014 and 2015. Successful completion of the acquisition is contingent upon the Company obtaining financing, and subject to other customary closing conditions. The transaction is expected to close during the second quarter of 2013. Evergreen International Aviation, Inc. continues to operate Evergreen International Airlines (Marana). Delford M. Smith originally founded the company as Evergreen Helicopters in 1960. This entry was posted in Erickson Air-Crane, Evergreen Helicopters and tagged aviation, erickson air crane, Evergreen Helicopters, Evergreen International Airlines, transportation on March 20, 2013 by Bruce Drum. Aero Air (Hillsboro, OR) has acquired the Butler Aircraft (Redmond, OR) air tanker operation, including its three aging Douglas DC-7s, located at the Madras Airport, according to the Madras Pioneer. 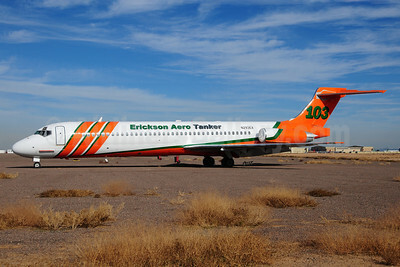 The new air tanker operation is now known as Erickson Aero Tanker. Seven former SAS McDonnell Douglas DC-9-87s (MD-87s) are being acquired and at least four will be converted to air tankers. This is a new use for the versatile DC-9. The new name comes from co-owner Jack Erickson, who was the founder and former owner of Erickson Air-Crane. The new company has been awarded the next generation air tanker contract by the U.S. Forest Service according to the article. Copyright Photo: Ton Jochems. Formerly operated by Iberia as EC-FFA and SAS as SE-DMN, this McDonnell Douglas DC-9-87 (MD-87) is getting a new life as an air tanker. The airframe as been re-registered as N293EA and adopted the air tanker fleet number of 103 as seen at Goodyear, AZ. This entry was posted in Erickson Aero Tanker and tagged 53209, Aero Air, aviation, DC9, DC987, Erickson Aero Tanker, erickson air crane, Goodyear, GYR, jack erickson, McDonnell Douglas, McDonnell Douglas DC9, McDonnell Douglas DC987, McDonnell Douglas MD87, MD87, N293EA, transportation on January 5, 2013 by Bruce Drum.